Got an old monitor or TV lying around? Is it HDMI ready? Then maybe you should check out the Chromebit. A brand new device from Google and Asus that brings a Chrome OS-based computer to any HDMI capable display. Simply plug in the device and you’ll be good to go. Coming in at only 2.6 ounces and roughly the size of a Snickers bar; it’s a lightweight and portable device you can take anywhere. At $85, it’s also a great budget solution to having an at home or on-the-go personal computer. 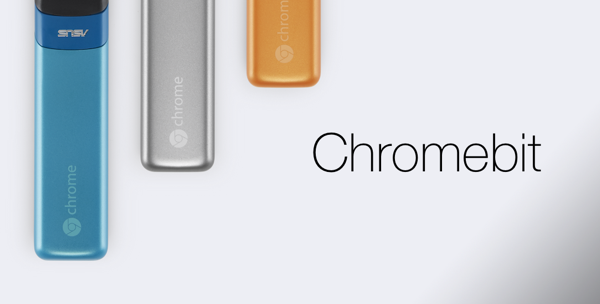 The Chromebit comes with only 16GB of storage and 2GB of RAM, so you won’t be able to get too crazy with it. Things like taking important documents, and personal files such as music, photos, and a movie or two with you wherever you go seem to be the ideal use for the device on the simple side of things. It's much more than just a glorified USB you store things on. On the Chromebit, you’ll be able to use any web app. You can get your fill of media content by watching your favorite movies and TV shows on Google Play, Hulu, or you could even kick back with Netflix and chill. With the endless amount of web apps available for you to download, the possibilities are endless with what you can do with the Chromebit. One of the more popular uses for the Chromebit, is its ability to become a single-use kiosk for business or education purposes. It’s only $24 per user a year. If it’s something that could be of use to you, make sure you check that out when you have the time. The Chromebit also comes with a dedicated charger and a USB port which will allow you to attach things like mice, a keyboard, or even better, a USB hub. If you want to use a wireless mouse and keyboard, you’ll be able to do that as well. As for the colors, you can get yours in either Cacao Black, Tangerine Orange, or a nice Cool Blue. In the U.S., the Chromebit will be available at Amazon, Fry’s and Newegg. It’ll also be available in Australia, Canada, Denmark, Finland, Japan, New Zealand, Norway, Spain, Sweden, Taiwan and the UK. Thanks to Tag 7s for submitting this topic! Sosuke Aizen, boonk, Nauglamir and 5 others like this.